Via Command Prompt is to easy to create at once, several sub folders levels in every Windows OS? 1.) ... Easily create directories with the cmd.exe! 2.) ... Create a folder with several subfolder levels! 3.) ... Deletes all directories with all subfolders and files! 4.) ... Do not be confused by the folder item terms! 1.) Easily create directories with the cmd.exe! Here is a simple example with 2 subdirectories (Folder1, Folder2) for each folder a separate command! 05/23/2018  08:46 AM    < DIR>          . 05/23/2018  08:46 AM    < DIR>          .. 2.) Create a folder with several subfolder levels! (Image-1) Create at once several sub folders levels in all Windows OS! The help file for windows MKDIR command! 3.) Deletes all directories with all subfolders and files! The command RMDIR or shortened version RD can be used to delete individual directories or directories with subdirectories. 4.) Do not be confused by the folder item terms! Different identifiers for one and the same thing here's a quick overview. A directory or folder Creating the command prompt is really easy and suitable for Windows 10 (Redstone 4 & 5), 8.1, 8, 7: Pro, Home, Enterprise, Basic, Premium, Professional, Starter, Ultimate, Windows-Server 2016, 2012, 2008, and older Windows operating systems. 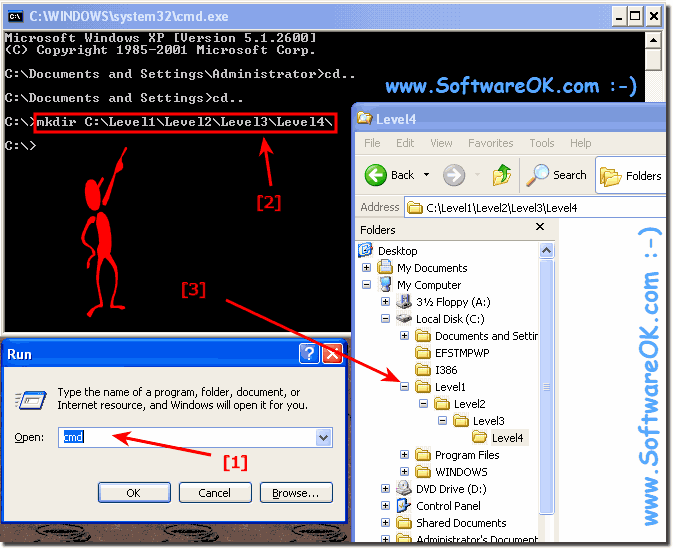 Windows-Console - FAQ-6: How to create at once several subfolders levels (commando-line)? Creating directories and deleting not using PowerShell to create or delete a directory is with cmd.exe supposed to somehow go into creating batch files which can then automatically create subfolders, but how? Mkdir command extension enable prompt? Cmd command to create folder? Windows mkdir create intermediate directory? In Windows Console on Windows xp create directories with subdirectories? In Windows 7, create directories with subdirectories at once? Create multiple subdirectories with a command in Windows 8.1 or Server 2012? Wondering how to create folders via script as an administrator and standard user under Windows 10 and 8.1? Using batch file to automatically create directory with cmd.exe? Creating a folder tree with command line CMD under Windows? Can one create and delete folders with the CMD? I want to create with the help of a batch file, so only a folder automatically subfolder, is so what?